Charolais bulls led the trade at 4,500gns on Friday 21st November 2008 at the breed society’s autumn show and sale which also featured the annual consignment of Cracker females. Sale topper at 4,500gns was the day’s reserve male champion, Esgob Cai, a 17 month old who was within the breed’s top 15% with a Self Replacing Index of 32. Bred and exhibited by Gareth Jones, Cwmtirmynach, Bala, Cai was by the 18,000gns Thrunton Virginian, paternal brother to Thrunton Voldemort who sold the same day in Perth for 55,000gns. Cai was knocked down sold to VS Allgood, Nunwick, Hexham. Next in the bull section at 3,800gns was Moelfre Commando, a 19 month old second class prize winner by Gretnahouse Vigorous and out of a Thrunton bred cow by Mortimers Politician. Bred and exhibited by Kevin Thomas, who was making a 600 mile round trip from Newcastle Emlyn, Commando continued to travel north with his buyers, P and M Watson, Durris, Kincardine, Aberdeenshire. Two more Vigorous sons from Kevin Thomas were knocked down sold at 2,500gns each to the same buyer, Westcott Farms, Brentor, Tavistock. First was the April 2007 born Moelfre Comet who was out of a Mowbraypark bred cow by Mowbraypark Paramount. Later in the day, Westcott Farms secured Moelfre Colorado, a June 2007 born entry out of a homebred Moelfre cow going back to Allanfauld and Moyness lines. 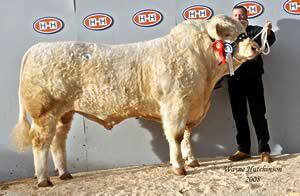 Vanessa Vasey, Wetheral, Carlisle offered Border Centurian at 3,500gns to MR McCornick, Kirkcowan, Newton Stewart. Centurian was a 17 month old by Edenhurst Titus, while his homebred dam went back to Oldstone Egbert. Another Welsh bred bull making a successful journey from Wales to Carlisle was the second class prize winner, Hendy Celt, an April 2007 born Tullygarley Rollerball son and out of a homebred dam by Doonally New. Bred and exhibited by Wyn and Diane Rees, Llangurig, Llanidloes, he was purchased for 3,000gns by HG Graham, Chapelknowe, Canonbie. A bid of 2,800gns secured Bleasdale Colorado for JB Paterson, Amisfield, Dumfries. Another 19 month, Colorado was by a Doonally New, and he was offered by the Kelsall and Marsden partnership, Goosnargh, Preston. Three more lots were bid to 2,500gns a piece. First to go was the 21 month old Caylers Columbus, a first class prize winner by the 15,000gns Burradon Talisman, sire of the 55,000gns Thrunton Voldemort and out of a homebred cow going back to Killadeas Lloyd from the Barker family, Nuthampstead, Royston to WJF Vance, Whithorn, Newton Stewart. Next at 2,500gns was Hackleton Chieftain, another 21 month old this time by Kilcullen Ted and out of a homebred cow going back to Lendor lines. 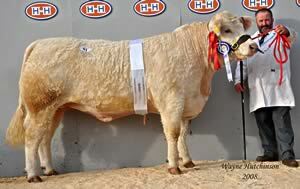 Bred by Hackleton Farms, Hackleton, Northampton, the buyers were IHW and JE Bothwell, Patna, Ayr. Shraden Concorde, a May 2007 born entry from Roger Everall, Shrawardine, Shrewsbury was secured for 2,500gns by S and E Mair, Waterbeck, Lockerbie. Sired by the 10,000gns Inverlochy Topsire, Concorde was out of a homebred dam going back to Balthayock Matthew. Heading the Cracker section at 4,400gns was the reserve female champion Mowbraypark Crystal who was within the breed’s top 15% with a Self Replacing Index of 35. Bred and exhibited by Mike and Margaret Atkinson, Kirkby Malzeard, Ripon, this 21 month old maiden was by Inverlochy Topsire and out of a homebred cow by Mowbraypark Paramount. The buyer was FE Hoad, High Blantyre, Lanark. At 3,500gns, the Boden and Davies partnership, Mellor, Stockport secured Trefonnen Caroline, a March 2007 born Burradon Talisman daughter and out of a homebred cow from Mr and Mrs Roy Hughes, Trefonen, Oswestry. The fixture featured a collective sale of females which was topped by a couple of cow and calf pairs from Tom Cox, Great Longstone, Bakewell. First at 4,500gns to CH and GA McDowell, Billesdon, Leicester was Bleaklow Solitaire, a seven year old by Baggrave Minstrel sold with one of her March born twin heifers at foot, Bleaklow Dawn by Allanfauld Superscot. A bid of 3,500gns secured the second outfit from Tom Cox for A and G Wood and Scott, Forest-in-Teesdale, Barnard Castle. Bleaklow Roche was an eight year old Balthayock Nougat daughter sold with her March born bull calf, Bleaklow Dambuster, by Superscot. Andrew Sellick, Williton, Taunton went to 3,300gns for Robbie and Kathleen Jackson’s (Seaville, Silloth) Seaville Vanity, a four year old by the 12,000gns reserve Perth champion Mowbraypark Northend sold with her rising 12 month old bull, Seaville Countess by Burradon Talisman.